At the beginning of the month a number of canoes and kayaks have been stolen from the east of the county. Two beach huts were broken into at Tankerton and kayaks taken. One kayak and road trailer were taken from a front garden in Westgate-on-Sea between 11th & 13th. One person has been arrested in connection with these kayaks after investigation by our Marine Specials, enquiries on going. Four outboards were taken from Bow Bridge Marina, Yalding between 8th & 10th. Gravesend Yacht club was hit overnight of 18th & 19th with seven outboards taken. Ranging from a £50 Seagull to a £1000 Honda 2hp. All engines were small, but overall ten outboards have been reported stolen this month. The Unit will be at this Autumn’s Boat Jumble at Detling on 7th October 2012..
On 20th November, Hoo Marina was sold to Denis Swann, the owner of Port Werburgh, the residential marina. Hoo Marina will no longer accept visitors and its name will disappear. The Medway Swale Estuary Partnership have asked us to look out for invasive species. The Carpet Sea Squirt has been identified at Cuxton. This is a highly invasive non-native marine animal, thought to be originally from Japan. By smothering native species, it not only poses threats to conservation but also to the fishing and shellfish industries. • It has a uniform pale orange, cream or off-white colour. • The surface has a firm leather y texture, with a veined marbled appearance . • Its surface has numerous open small pores, which close up out of water to produce pale spots. • It can grow either as thin flexible sheets or hang down in long rope-like growths. Shallow waters, such as harbours and marinas. Usually found growing on hard surfaces, including the underside of jetties and boulders. Look out, it’s a berm! Following pressure from the MYA, RYA and East Coast Pilot, London Array has had special buoyage installed by Trinity House to mark the rock “berms” which were dumped over the electricity cables on Kentish Flats leaving less than a metre depth at low tide. 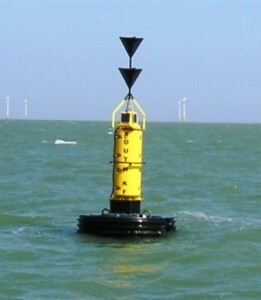 Following a further request from the MYA, the southernmost buoy was replaced with a large south cardinal (see photo) and a north cardinal buoy was also installed. Following a thorough review, in which it was found that many involved with boating on the tidal Medway and Swale did not feel the MYA was for them, the Association will be relaunched as the Medway and Swale Boating Association, subject to ratification at the AGM in December. All clubs involved with leisure boating (sailing, rowing, motor boats, kayaks, whatever) are invited to join us in promoting and protecting our leisure activities. We also welcome berth holders associations and businesses such as marinas who support leisure boaters. Thirdly we welcome the growing number of groups who restore and use classic vessels on the tidal Medway and Swale.